Today is June 21st , the beginning of summer ! We hope you have found everything in order at your cottage when you came up for the May long weekend. Your dock is now in, your boat or other water toys are launched and you are ready for summer! Your BLA executive has been busy too this Spring. Our first event this summer will again be the BLA Social on July 28th, on Elkee Point Road. This year’s Kids Fun Day will be on August 18th (rain day 19th), in the boat launch bay. Our AGM will be August 25th , 2018 at the Community Centre, starting at 9:30am with something new this year. We will have a short brainstorming session on how to shape the future of Brandy Lake and moving forward for the next decade. Stay tune, more info to come! We have gotten our shoreline assessment from the Love Your Lakes program for all of Brandy Lake, it is attached to this email. We did quite well but there is still work to be done. Every property owner can do their part in protecting the health of our lake.The shoreline is the most important part between land and water, it is here where we all have to work hard and keep natural vegetation growing. See more on this below. On another note, but as important, are our septic systems. The Township of Muskoka has come around this May to inspect the septic beds and tanks. You should have found a questionnaire on your door, which they have asked you to fill out and take to the town hall. We need your HELP ! We have an executive position open right now. This fall we have Municipal elections on Monday, October 22nd. To make sure you are registered to vote in this fall’s municipal election check your municipal tax bill. You and your spouse are both entitled to vote even if only one is on title. Go online to www.voterlookup.ca , enter your roll number and follow the prompts to ensure you are both on the Voters’ List. For those who have asked whether they can vote in both Muskoka and their home municipality on Octonber 22nd, 2018, the answer is YES – a Muskoka property owner and their spouse can vote in both Muskoka ( as a ‘non-resident elector’) and the Ontario municipality where they live (as a ‘resident elector’). I hope you all have an exciting summer on Brandy Lake !!! Love Your Lakes follow up. Following last year’s participation in the Love Your lakes program, over 60 property owners have ordered their personalized shoreline report and many have viewed their report on line. A summary of the results for the entire lake has been published and is attached to this newsletter for your information. It does make interesting reading as it captures the shoreline health of the lake. It also identifies the opportunities for stewardship to continue to protect and enhance the quality of Brandy Lake. 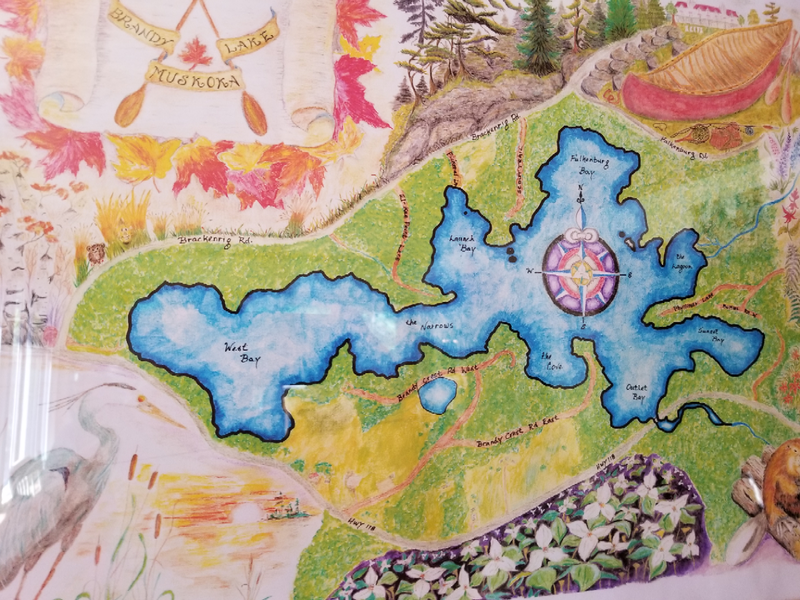 As participants in this national program Brandy Lake will now be eligible for a one time grant to a property owner who wishes to naturalize their shoreline. If you are interested, please read the attached document outlining the criteria for eligibility and the application process. The grant is just over $1900 and includes the natural vegetation for plantings, the labour and the equipment to complete the shoreline restoration project. The homeowner is expected to participate in the project. If there are multiple applicants for this grant, the property whose shore restoration is deemed to most benefit lake health will be chosen. If multiple properties meet these criteria, there will be a draw to finalize the recipient of the grant. This is an excellent opportunity for someone who would like a more natural shoreline and is uncertain how to go about it. We hope someone on the lake will take advantage of this one time grant. In the past we have been proud to have a very high percentage of our property owners chose to be members of the Brandy lake Association. We have moved to a two year membership period to streamline the process with memberships running January 1 (odd year ) to December 31 (even year) This means we are currently in year two for the 2017/2018 membership year. Some folks continue to prefer to pay $25 yearly so you may be contacted by your road rep asking for your dues for 2018. We can email you membership forms and you can return these by mail with a cheque or if you prefer, return the form by email and etransfer the funds. These membership dues are important to our Brandy Lake Community. We are actively engaged in a number of initiatives to benefit all of us who call Brandy Lake home for part or all of the year. Your dues ensure our continued participation in the water testing programs to monitor phosphorous, calcium, e coli, and clarity all indicators of lake health. We are monitoring lake levels, working to maintain the beaver baffler, watching for invasive species, educating folks on protecting the lake, working with the township to ensure appropriate and safe use of the boat launch and representing Brandy lake at District and township levels as decisions are made about lake quality, development and changes in bylaws that affect us as residents. We maintain a website for informing our membership on issues of lake stewardship, community issues, and informal advisories on ice and snow conditions during the winter. You can also use this website to post lost and found information or items for sale. Your association executive works hard on your behalf and membership dues are important to our continued success as a Brandy Lake community. Some of our members also chose to be members of the MLA. This associate membership costs $50 annually (an increase for 2018 from the previous $45) Each membership gives our BLA a $30 discount on our water testing fees. This means a substantial reduction in the nearly $1000 we pay as our annual fee. An MLA membership also provides associate members regular email newletter updates on MLA intitatives and a 10% discount card at participating merchants around Muskoka. If you are interested in an MLA membership you can purchase it through the BLA. If you purchase it directly through the MLA be sure to let us know as we must track our association members in order to receive the water testing program discount. 9:30am Stay tuned for more details later in the summer. Something new…..
Let your friends and neighbours know about these events and bring them along, especially if they are new to the lake !